If you have a large overgrown pasture, you need the Swisher 44" Trailcutter. 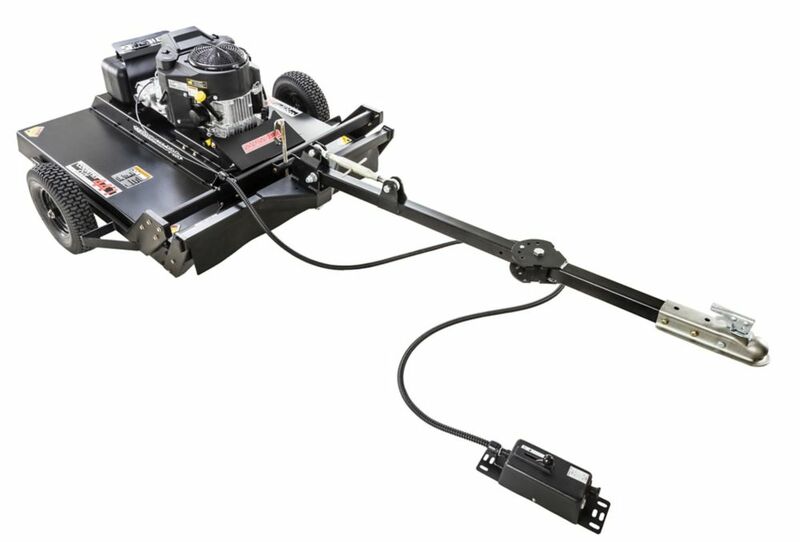 This mower easily attaches to your ATV or UTV and is the ultimate time saver for large jobs. This mower will cut brush up to 3" in diameter. It features a powerful 14.5 HP (603cc) electric start Kawasaki engine, two 16" pneumatic sealant filled tires, two heavy-duty swinging blades, and a convenient single-point cutting height adjustment with a cutting range from 3 7. The remote operator control console lets you safely engage and disengage from a distance. Heavy duty work requires Swisher's heavy duty Trailcutter! U1L battery not included. Agri-Fab 25 Gal. Tow Sprayer can handle yards of any size. With its easy-to-grip hand gun hoses its perfect for additional spot spraying in hard to reach places. Easy and quick to apply herbicides, insecticides and other lawn care products on lawns, trees and shrubs. Connects easily to towing vehicles power source and can be operated from vehicle seat. The 94.6 L Sprayer for riding mowers disperses water at a flow rate of 2 GPM for excellent spraying power. This Sprayer attachment features a 12 ft. hose and a galvanized steel frame. Ultra Lo-Drift spray tips offer maximum effectiveness; best performance for both contact and systematic weed kill with least wind-drift. The Everbilt flat free replacement tires provide a cushioned ride that can also withstand punctures from common objects that cause flats. This helps eliminate all downtime related to flat tires. These tires are extremely durable and can last up to 10 times longer than standard air filled tires. The Everbilt 97040 model features a 10 inch. diameter wheel with a 3 inch. saw tooth tread face and a 300-lb load capacity, and a 5/8 inch. offset bore. All season protection against sun damage, rain dust and tree sap. Dual reinforced air vents let air circulate and help prevent ballooning in wind. Elastic cord in bottom hem for a quick and custom fit. Fits Gator models with OPS or cab structure. Commercial Pro 44-inch 14.5 HP Tow Behind Trail Cutter (Bush Hog) with Kawasaki Power If you have a large overgrown pasture, you need the Swisher 44" Trailcutter. This mower easily attaches to your ATV or UTV and is the ultimate time saver for large jobs. This mower will cut brush up to 3" in diameter. It features a powerful 14.5 HP (603cc) electric start Kawasaki engine, two 16" pneumatic sealant filled tires, two heavy-duty swinging blades, and a convenient single-point cutting height adjustment with a cutting range from 3 7. The remote operator control console lets you safely engage and disengage from a distance. Heavy duty work requires Swisher's heavy duty Trailcutter! U1L battery not included. Commercial Pro 44-inch 14.5 HP Tow Behind Trail Cutter (Bush Hog) with Kawasaki Power is rated 4.7 out of 5 by 6. Rated 5 out of 5 by Chaindog from Cleaned out a stand of blackberries with no trouble. Mowed my hillside and pasture in record time... Cleaned out a stand of blackberries with no trouble. Mowed my hillside and pasture in record time. Great Machine. Rated 4 out of 5 by gm4511 from Only used once since purchase but so far I'm very happy with purchase. The only complaint is the... Only used once since purchase but so far I'm very happy with purchase. The only complaint is the flimsy control panel. Otherwise, it does burn a lot of gas but it mows like a beast so I'm ok with fuel consumption. I had home delivery and while the shipper was helpful getting it on my trailer in the crate it was not easy. I wish I had chosen delivery to store, I'm sure Home Depot would have made this step much easier. Rated 4 out of 5 by Randy from Started right up and ran great for about 20 minutes... Started right up and ran great for about 20 minutes then died, turned key and no connection, checked battery, fine, checked power to and from, not fine, pulled apart junction box and key ignition switch inside had been disconnected, wires all bunched up around throttle, taped wires togethrt, moved away from throttle, started right up and has worked great ever since. Rated 5 out of 5 by MontanaSwisher2017 from Its a horse--solid steel so heavy--with the help of my son we got the handle on and bought and in... Its a horse--solid steel so heavy--with the help of my son we got the handle on and bought and installed the battery. Its a rough cut so not really for lawns--but great for our 13 acre field-cut for 90 minutes and used about a third of a tank of gas.